Following the first-ever successful salvo test of the U.S. Ground-based Midcourse Defense missile defense system against an intercontinental-range ballistic missile (ICBM) class target last week, China’s Ministry of Defense has expressed concern about strategic stability. “The Chinese side regards missile defense as an important issue of strategic stability that matters on the trust between countries,” Senior Colonel Wu Qian, director General of the Information Office of China’s Ministry of National Defense and the ministry’s spokesperson, said during a regular monthly press conference. “It should be handled very carefully,” Wu added. China has in the past expressed concerns about the United States developing missile defense systems capable of posing a threat to its second strike nuclear forces. 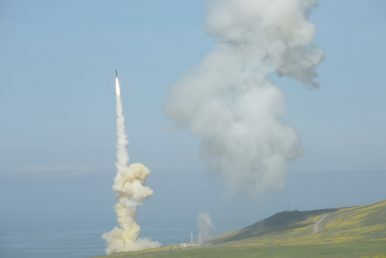 On March 26, the U.S. Missile Defense Agency declared that its most ambitious test to date was successful. “This was the first GBI salvo intercept of a complex, threat-representative ICBM target, and it was a critical milestone,” said MDA Director Air Force Lt. Gen. Samuel A. Greaves in a statement at the time. Wu’s remarks on U.S. missile defense developments come not only after the latest test of the Ground-based Midcourse Defense system, but also not long after a senior U.S. official suggested that American efforts to ameliorate missile defense capabilities were driven by concerns about China. As The Diplomat reported on March 19, U.S. advisor to the president on national security affairs, John Bolton, underscored the Trump administration’s concern about China as a reason for pursuing advanced missile defense capabilities. China’s concerns that U.S. missile defenses are directed against its nuclear forces, which are considerably smaller than U.S. forces, could prompt it to pursue a strategic arms build-up or explore different command and control procedures and postures. A top U.S. official contradicts the 2019 U.S. Missile Defense Review’s view on managing China’s strategic arsenal.